Named for the hot springs where you can soak after a long trek, Aguas Calientes Peru is the service town for Machu Picchu. There is a large range of hotels and restaurants catering to most tastes. The average restaurant is considerably more expensive than Cusco due to its proximity to Machu Picchu, but there is a fun village style atmosphere that makes this a good place to hang out. There is wifi available in most hotels as well as internet cafes, though these are also more expensive than elsewhere. It is also the terminus for trains from Cusco, with the tracks running through the main street. Many people choose to spend a second day at Machu Picchu to fully appreciate its grandeur, while others like to hang out in Aguas Calientes Peru. There are many things you can do while enjoying a second day in this village! The Aguas Calientes Peru hot springs are about 800m east of the center where the hot, sulphurous waters emerge from the rocky subsoil, reaching temperatures of 38˚C to 46˚C (100˚F to 115˚F). The pools in this place provide a basic infrastructure for using the hot springs. They appear quite dirty but this is actually an effect of the sulphurous waters and a soak in the hot springs after a long hike is highly recommended! Bring your flip-flops, swim suit and a towel! The once-isolated village of Santa Teresa, just down the railway line from Aguas Calientes Peru, was once a sleepy backwater. Now, it is an ever-growing tourism centre! After regulations were first imposed limiting the number of hikers to trek the Inca Trail increasing numbers of trekkers sought out alternative routes, including the Salkantay trek and the Choquequirao to Machu Picchu trek which end near Santa Teresa. Several kilometres outside the rather unattractive village of Santa Teresa are the hot springs of Colcamayu. There are minimal fees to enter the hot springs and to camp. There is a bar, showers and toilets, but no restaurant at Colcamayu. The Colcamayu hot springs are a really wonderful place to spend the night when you have spent a few nights on the trail and are looking for a little bit of camping luxury. Colcamayu is not a “wilderness” camping experience by any means, but it is the cleanest and most fun camping option in the Santa Teresa area. You can hike to a ridge that is between Inti Punku and the Caretaker’s House, or you can visit Huayna Picchu. Other people like to make a trip to Mandor Pampa. Ask when you are in Aguas Calientes Peru for other things to do! There is no ATM in Aguas Calientes Peru though you can pay at many restaurant and hotels with Visa (for a surcharge). You can also exchange money. There is a bus that goes from Aguas Calientes Peru to the Machu Picchu ruins, but you can also walk. The price for the bus is $24 return or $12 one way. This fee is included in all Apus Peru Machu Picchu treks; if in doubt, please ask. Some people like the climb up, others prefer to take the bus up and walk down. Others like to walk both ways! It takes around 1.5 hours to walk up. It is quite a climb, but then you appreciate the tenaciousness of the Inca people even more! Tree House restaurant – Associated with the Rupa Wasi Hotel. El Indio Feliz – Easily considered the best restaurant in Aguas Calientes. Inkaterra Restaurant & Café – Offers the same sensational service and meals as this beautiful hotel. Enjoy free wifi and comfortable rooms in this standard Aguas Calientes hotel. Just a three minute walk from the main plaza, Waman Hotel in Aguas Calientes also includes breakfast. Rooms at the Waman Hotel also include cable TV, a minibar and private bathrooms. At this Aguas Calientes hotel, you are free to use the hotel’s own internet-connected computers. They also offer luggage storage and a helpful 24-hour front desk service! If your trek includes a Standard hotel in Aguas Calientes, you can also consider upgrading your Aguas Calientes hotel. For current availability and the best prices, click here. This Machu Picchu hotel offers great value, with nicely furnished rooms, all amenities and even a free shuttle to and from the train station. Guests arriving to the hotel are welcomed with complimentary fruits and beverages. Breakfast is a buffet featuring a variety of local, seasonal fruits. There is also an on-site restaurant that offers typical Peruvian dishes. The rooms at this Machu Picchu hotel are decorated in a rustic style with charming wooden furnishings. All rooms have wifi and flat-screen TVs, and some have private balconies! 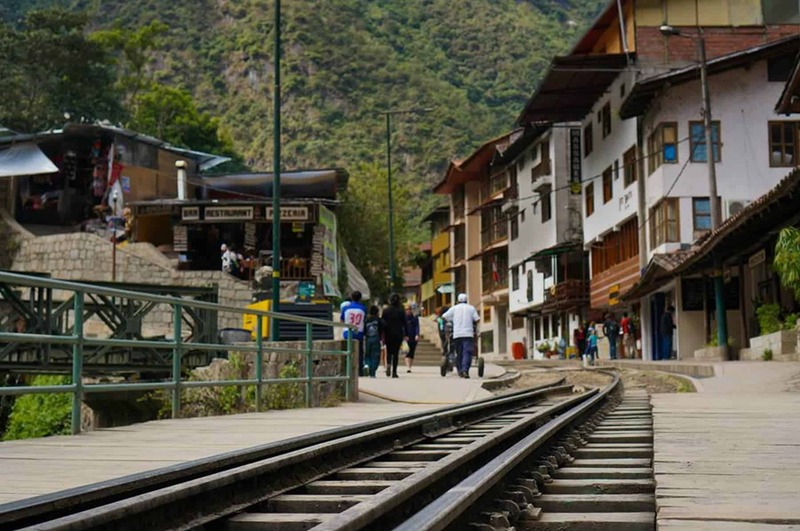 This small Aguas Calientes hotel offers a peaceful retreat from the village. Though you are still right in town, you feel that you are in the cloud forest with cute balconies, and sensitively and attractively designed wooden rooms. This hotel is one of our favorites in Aguas Calientes, with a real eco-lodge, alternative feel. Also check out their Tree House Restaurant, right next door! Keep in mind there are lots of steps, which can be a little tiring after a trek, and, given that it is made of wood, sound travels and some people find that it is noisy. Being just a 5-minute walk away from the Machu Picchu bus stop, this Aguas Calientes hotel offers impressive views of the surrounding hills. It has quiet, comfortable rooms, including some with views of the hills. All rooms have cable TV, minibars and private bathrooms, and there is wifi access throughout the hotel. 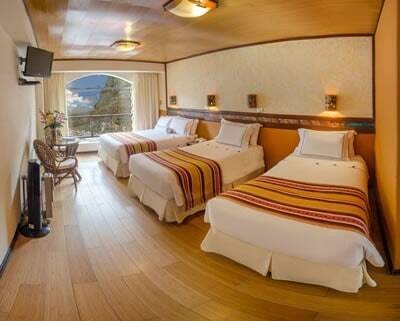 As a guest in this Aguas Calientes hotel, you also have the opportunity to relax in their panoramic sun terrace! As part of the Casa Andina Peru hotel chain, this hotel in Aguas Calientes maintains the professional, immaculate standard of its sister hotels through Peru. With a strategic location in the small town and 54 rooms over 5 floors, it is a place to relax and restore your energies post-trek and pre-Machu Picchu visit. The rooms and bathrooms of this Aguas Calientes hotel are ample and comfortable and staff are keen to cater to your needs. Extremely popular at the moment! 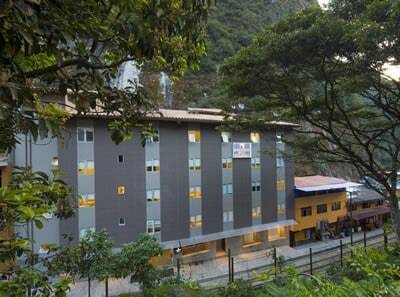 This new, large hotel offers a better-than-average stay for a hotel in Aguas Calientes. Located at the top of town, the rooms are recently built, and offer a clean and spacious place to rest before or after your Machu Picchu visit. Ask for the upper floors which have views across town. Smart, contemporary and modern are the best ways to describe this Machu Picchu hotel located in the heart of Aguas Calientes. The hotel is efficient and people-friendly; it welcomes a wide range of guests expecting an uncomplicated visit. Operated by Inkaterra hotels under their “By Inkaterra” label, this smart Machupicchu hotel offers the same standard of service that we expect from their more expensive hotels. Added bonus: dinner is included in the room rate! This is an attractive hotel in Machu Picchu designed in a rustic style with natural materials, which features spacious rooms with Queen size beds, fireplaces, showers with a view of the river, and wooden floors. The Hatun Inti Boutique Hotel in Aguas Calientes is a welcome addition to the range of hotels in Machu Picchu. Dinner is also included in the room rate! This Machu Picchu hotel offers beautifully furnished, comfortable rooms with big beds in-keeping with the hig- end standards of the Casa Del Sol ‘boutique collection’. Casa Del Sol – Aguas Calientes creates a luxurious setting with fantastic restaurant service, accommodating staff, impeccable attention to detail and an elegant mix of modern and rustic décor. Everything is in place to ensure a memorable stay! This impeccable Machu Picchu hotel is Aguas Calientes Peru’s only official five-star hotel option. It’s luxurious, pretty, and very classy. It offers a world-class spa and other options such as cooking classes. Prices include breakfast, afternoon tea, and either lunch or dinner. If you feel like spending some time kicking back in Aguas Calientes Peru, this is a great place to do it in style. Meal included in room rate. This hotel is like a tiny slice of paradise in Aguas Calientes Peru and a stay here would make your visit to Machu Picchu doubly memorable. The hotel is perched on the edge of Aguas Calientes Peru but is a world unto its own, having developed and grown in an organic manner so there are all types of rooms and services on offer. If you’re looking to splurge, this is an amazing place to stay. There are suites, little houses, secret spas… this is a magical Machu Picchu hotel with superb atmosphere! There are daily talks and guided tours included in your stay, providing some excellent interpretation and information. Not only the most amazing hotel in Aguas Calientes Peru, this is by far one of the most amazing hotels we have seen in all of our travels!! The Machu Picchu Sanctuary Lodge is all about location, location, location – who can beat a hotel that looks out over the ruins of Machu Picchu? The main selling point of this Machu Picchu hotel, part of the Belmond group, is this very famous view, though not all of the rooms actually have a view. Rooms are considered small for the price. Food is included in the cost of the room, but usually not raved about. Location is what you pay for here!